Cardinals are a sign of winter up here in the Northwoods and I love them. My mom loves them even more, so when I saw other demonstrators making punched cardinals, I knew I needed to try it out. I saw the cardinal with this tag background on Stampin' Connection, an online sharing site for demonstrators. 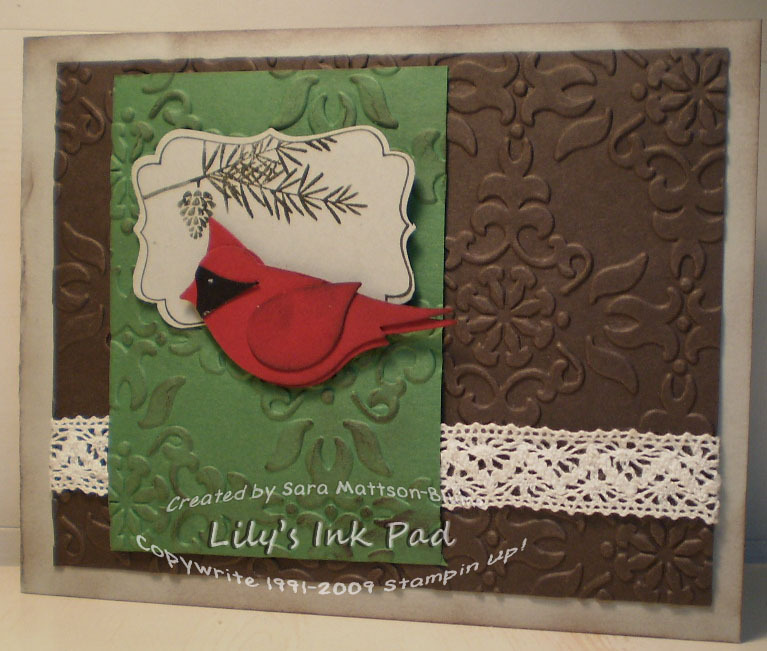 Marie-Lyne Vervoite from Quebec, Canada, shared a card with a cardinal next to this punch. How cool to learn from demonstrators all over the world! This was my last contribution to the Christmas Club! I am so sad that the clubs are over! I had a great time and am enjoying having so much more time to stamp! Awesome card! I love the texture and I love the punched cardinal!